Learn How to Read Tarot! WARNING: Include your own keywords and description in reply below BEFORE reading anyone elses. Carefree. Youthful. Clueless. An adventure is at the cusp. Feeling cocky. Nothing can phase me. The Sun. Uranus. I’m in limerance (love). Taking everything in that there is to take. Being free. Open to possibilities. Asking: What’s next? Feeling warm even when everyone else is cold. Optimistic. The future. Luck. Self-made person. This is what I want and it’s all mine to have. Seizing independence. Excited about learning. Polarity: Uranus, Aquarius. The Sun, Leo. Under some influence of Mercury, Gemini and Jupiter, Sagittarius. Numerology 0. Zen, all and nothing. Freedom. Fancy-free. Walking on a cloud. Try anything. Positive. Joyful. Optimistic. Laugh in the face of danger. Fly like an eagle. Overly confident. Chameleon. A young man performing a dance routine with his faithful partner – a white puppy – on the edge of the world. Water rises up and crashes against the cliff. He can go anywhere. He has smelled the roses and plucked a flower to take on his adventures. Having only the clothes on his body, and tools of trade in his bag, he wanders into the unknown head held high, moving without purpose and enjoying the journey of pure innocence. This will be a long w.i.p. (work in progress) as there is so much to learn about a single Tarot card and there are 78 of them! Please free to add your own thoughts and ideas about any of the cards (in their appropriate post). The insights are mine unless I state otherwise. I’m aware of the words of other’s but this category is about reflection. However, under the astrology heading I’m learning more so it might not be my own words (and I will give credit where credit is due). And as I glean new understanding and more knowledge, under headings of interest, I will continue to edit and record. 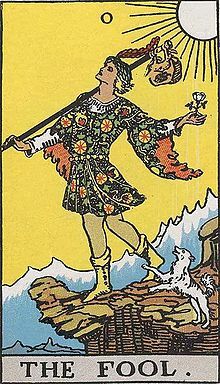 The Fool is the first card in the Tarot card’s deck of 22 major arcana cards. Twenty-one more cards take us on a journey of a lifetime with all the wonderful up’s and down’s we receive and the Fool sets the pace. Alpha and Omega. Nothing and Everything. Wholeness. Never ending. Duplicity. One half of infinity (the World, being the other half). Mountain: On top of the world (the world being the last card of the major arcana). The Sun: bright , happy, life giving but also destructive. A cut flower: life, beauty, having something to give but also being transient with sure decay in a short while. Human: Arms wide open. A welcoming posture. One foot forward and one back. Moving ahead but also being careful. Dog: Warning or excited to go on the journey. I’m not going to cover how to read upright or reversed cards but rather include insights and ideas about the card’s many meanings. Carefree. Light. Lighthearted. Brilliant. Whole. Happy. In a self created/contained bubble. Journeying. Adventure. Happily independent. Independence. Making foolish decisions. Not paying attention to where one is going. Not listening to others. Having a good time. Taking a quick or unexpected vacation. Having a travel partner who is coming along for the ride. Starting over. Starting fresh. Learning by oneself (autodidact). Wanting to make mistakes or test oneself. Free-spirited. Possibilities. Youth. Folly and frolicking. Practical Joker — “just kidding!”. Lack of seriousness. Things or rather people are not as they appear. This isn’t because they are being deception but rather other’s are not seeing clearly or don’t want to see clearly. Change, Revolution, Disruption, Originality, Rebelliousness (taken from: Elysian Astrology) Astrology is a weaker area of understanding for me but I’m learning. Archangel Metatron’s planet is Uranus. In tarot, there is no right or wrong just difference. Allow yourself to write your impressions without worrying about whether you are right or not. You will soon find your impressions being bang-on. 1.Who, what, why, when, where, and how? 4.There’s a story or allegory in every picture card. What is the story telling you? 5.What is the symbolism of colour and object in the picture? 6.Who are the people in the card? Why are they there? What are they doing? 7.What is the message of the card? 8.Where is the scene taking place? Describe the card and add some keywords or phrases to your reply. Let us know what you think the card means, what it’s all about. It’s your interpretation of the tarot card meaning and if your interpretation is sincere it will be Accurate, Right, and True. You can not go wrong! Remember to include your experience with tarot and your correct email address (it won’t be published). You can post as many times as you like!! Thanks. A warm welcome to you! My name is Psychic Jucy, a certified professional tarot reader CPTR under the name Abella Arthur. I fell in love with Tarot in 1996 and I come from a long line of readers. Since 2005, I have read tarot professionally. Unless reading at an event or party, I give readings by phone. I find this is convenient for my clients and it's a pure and accurate read. What I do in the world of all things divine.. I read by phone. I'm well skilled in tarot, astrology, and numerology. I also read at events. Visit my main consultation page: Readings By Phone, FAQ, and Subscribe for a FREE reading. Novice Tarot Reader. Reading since May 2010. Keywords – Carefree, regardless of life’s challenges and pitfalls. Short lived luck! Animal instincts. Joy. Excluding others. A new pursuit. Understanding and creativity through confidence and error. Description – Edge of cliff but not looking down. Small sack. Left home, no attachments. No consideration for responsibilities / obligations. Always looking forward yet ignoring time, destiny. Taking things a la bon franchette. Possibilities open and all potentials, ingredients, and tools available. The flower shows that things wanted will naturally come; however, no foundation(jurisdication) and short-lived. Feeling like this rules the Sun, Aries, and Jupiter. I see a boy who has his thoughts on Cloud Nine, but his feet are on the ground. He is the daydreamer and a lover of nature. Big ideas, ahead of his time, but likes to live on the edge and jumps into new endeavours without thought, sometimes (thus the boy in the card is standing dangerously close to the edge of the cliff). He has yet to find the balance to his aura. In the meantime, his one true and faithful friend (here shown is the dog) watches his back and protects him from harm. Hi L.S.! Fabulous interpretation of the Fool. How long have you been reading? Cheers!! To me, this card really talks to me about moving past fear and being able/willing to take a risk. A good analogy is from the Indiana Jones movies. There is one scene where Indy is high in the mountains and “knows” there is a secret bridge that he has to cross, but looking over the cliff he can’t see it. He just has to take a walk of faith and find the bridge, yet without actually be able to see it.Of course, others might think our choices are “silly”, “crazy” or “foolish”. But, part of the message of the Fool card is that it is okay to let go, or take a leap of faith. It’s about trusting your intuition, and allowing something to unfold. It can be a little frightening, but there is hope and there is help. In most Fool cards there is also a small dog, which can represent inner guidance, friends and aid. When you pull this card you may also want to look to what internal or external “advice” you have been unable to see or are simply ignoring. If you are really interested in learning more about this card, or the whole deck, you can also look more deeply at a particular card by looking into the symbolism, related myths, colors, shapes and imagery. Don’t be afraid to ask yourself questions, such as: How does this card make me feel? What memories are brought up when I see this card? Which people in my life does this card remind me of? You could even “act” out the card with a partner or group of friends. I’ve done this with groups of people. Everyone dresses accordingly and then creates a scene, alone or in pairs/groups, that portrays what they have come to understand about their card(s). You may be interested in books like: Jung and the Tarot, or other books about the deeper meaning of the symbolism within the card. You may also contact me at my email address or website (www.simplynumbers.com) – I work with Numerology to help you discover greater meaning in your relationships and life. To me, the Fool is all about having the faith required in order to take a risk, to take a chance on something new, whether it’s a new venture, job, relationship, what have you. The Fool is all about how our faith in a higher power can see us through, even when we think we’ve lost the ground under our feet. The Fool to me, is not what the name suggests, but represents that innocence and youthful outlook we all need to incorporate into our daily lives. Standing on the cliff, on the edge represents to me a look into the horizon and comtemplation before moving forward. Is it the right one, yes it is, for he has his dog which represents faith and loyalty and the flowers representing hope and love, and that without faith, hope, and love going forward with him, he is not embarking on his future, but will cause pain and heartache if he goes without them. So faith, hope and love it is he will take with him. The fool is merry, gay, and happy. He is full of life and adventure. He embraces life, loving each moment, as it is, with a pure and open heart. He is a wanderer, He is lives at the edge of life excitement, and he is never serious. Unfortunately, he was cast out of society and his only friends remain non-human. But this does not sadden him, on the contrary, He would not have it any other way. He is interested in following his own heart, making his own song and dance to the rhythm of life. The fool is fearless. The Fool is a liberated man, joyfull and sacred in awarness, always walking under the wisdom of the Sun. Is the One who embrace the moment of ‘now’ without remorse. He’s with a a happy Dog just in front of a risk and is happening now. the fool is the freedom ebodied, the teen spirit with thirst of experience. I love how you’ve expressed this card with the bag and dog!! The foolish fool? No, not necessarily. This card is gorgeous as it is the card of the jester traditionally. It also, is imaging a person filled with vision, wonder, excitement and questions. A person with thier bags packed but with little in them, enough to carry thiere own weight alone, the fool is off on a journey. . The issue though is that if the fool doesn’t see the cliff in front of them they are likely to fall over. This card asks the querent to pay attention to where they going before it’s too late? To look at others and not be too internal or self focused – to look beyond themselves.. Originally the fool wears ragged clothes and is dishevelled. This is not necessarily to be taken literally as a poor foolish person. This can reflect a ‘poverty consciousness’ and may be asking the quernt to look inner and to see if this is so – to take note of ones thinking and to ensure one is not acting from a place of negativty or nothingness.The fool has the opportunity for new beginnings but is asked to look and make the correct path based not on fear or ragged thinking but on what is right and good for the fools heart. Also as a jester, the fool, if they make the right choice has the potential to make merry and bring joy and goodness to those those around them. Are you the fool or the jester? Are you going on the right or best track – are you being clear and true to yourself? Jump in and take the plunge on whatever is holding you back and the fun will begin. This reminds me of the first and twelfth house, as well as the ascendant, within the wonderful world of astrology. As is with the 12th, and first house the native may not see themselves clearly and are very much internalized, and self-oriented. Cool, cool. You are about to encounter an event or experience that is completely new to you and outside of anything that has gone before. Listen to your instincts (gut feeling), but don’t give in to fear! Keep faithful to yourself and God that everything will turn out well. The best antidote to worry is a realistic approach – look carefully ahead and put one step down before you take another. You may not have much to start with – but who does at the start of any venture. You will gather new insights, friends, belongings etc along the way. (Material possessions would just tie you down at this time anyway.) Look – the sun is shining, it’s a beautiful morning – not a cloud in the sky! R- You are either being blindly optimistic about or letting worry and fears get in the way of a new experience or event. Meditate on what you truly want and what the most positive outcome would be for this new experience or event. Think big – don’t limit yourself, but stay positive in what you want to manifest – for yourself and others. That’s a fabulous interpretation Angel! Hey – this was a great exercise! It really forced me to clarify my own thoughts – before I read yours. Thanks – great teaching. On to the next one.. Thank you. I’m glad you benefited from my teaching style as that’s exactly what I had hoped for. The Fool is a kind of opposite to the thoughtfully reflective Star. They dress opposite. They have different companions (a dog vs an ibis). The Fool leans on what he has to get by. Beginner’s Luck, Learning By Trial and Error. Even though a small canine friend warns him, he is unaware of the warning and has resigned himself to going at it with his own strength. The Tarot in general is often about the qualities you learn in solitude while on your own path. The Fool has yet to learn the first lesson of Humility. The Star again has to remove the mantle of knowledge and look at what she already has. The Fool has an appearance of regal manner and wealth. The comforts of home are no longer available. This might mean running away, getting a new job, a new home, a new marriage, new anything but having to start with nothing and perhaps more dangerous, the illusion of something. Expectations are high but ability is still low. The Fool is soft and tender of foot, inexperienced and delicate. It will take some battle up through until the Emperor to transform this Fool into someone at least street smart. It’s not always a bad place to be. It can be a pioneering effort or breaking “new ground” so to speak too. As long as the fool is in the game, eventually, wisdom will be had from the suffering of various falls and mistakes. It may mean some pain or growing pains but pains that will be good for the long term if one sticks with the chosen path. It may also, on occasion a warning that you’re “in way over your head”. Looking for a professional tarot reading? A warm welcome to you! My name is Psychic Jucy, a certified professional tarot reader CPTR under the name Abella Arthur. I fell in love with Tarot in 1996 and I come from a long line of readers. Since 2005, I have read tarot professionally. Unless reading at an event or party, I give readings by phone. I find this is convenient for my clients and it's a pure and accurate read. About Psychic Jucy. I read by phone. I'm well skilled in tarot, astrology, and numerology. I also read at events. Visit my page: Readings By Phone, FAQ, and Subscribe for a FREE reading.